A variation on the behavior of some burglars has been reported. I don’t know at this point in which part of Altadena the incident occurred, but at approximately 2:30 am on Wednesday morning, a resident was awakened by the sounds of a woman in distress at the front door. The woman at the door said she and her baby needed help. As the resident was talking to the woman through the door, a man was attempting entry at the rear of her home. That has been a deterrent in some areas. Altadena Sheriff’s Station – 626 798 1131. You can stop in at the Sheriff’s Station and ask for stickers with the Sheriff’s Station’s phone number that you can put on your phone, so when something happens, you don’t have to try to remember the number. It’ll be on your phone. Here’s the fab artwork for the next art bender weekend in Altadena. Leaving the image sideways for now, so you can read the details. Lori and Scott at Webster’s Fine Stationers are already in the holiday spirit. They’ll be supporting two local charities–Danny’s Farm and Five Acres–with your holiday purchases and food donations. There are several exciting things going on at WFS these next couple of months! The holiday season is quickly approaching, and of course we’ll be dressing up the store but we thought we could do a lot more than decorate and hang ornaments. I’ve said before that in economic times such as these, it’s our local charities and non-profits that suffer the most. When people feel they have little to give, charitable donations are the first to be cut from the budget. We understand and believe me, our store doesn’t have room for much donating, either. But you know what? We’re still in business and our crew members are still employed and for that we’re thankful. In that spirit of thankfulness, we are going to be donating to two Altadena non-profits – Danny’s Farm and Five Acres. Read on and discover how we’ll be accomplishing this. Danny’s Farm is a a local non-profit with an amazing premise. We love how the Gott family’s vision has improved and enriched our community! They even have plans to expand that vision which will create more opportunities for the disabled in Altadena. To get there, they need our help and they need your help. If you order custom holiday cards from WFS this year, we will donate 15% of the net cost to Danny’s Farm. Don’t let the word “custom” scare you away….these cards are cost effective and beautiful. Best of all, you can be the designer of your own holiday card! We will have our catalog of holiday cards on-line at by late next week. From now until January 1st, if you order your gorgeous holiday cards through Webster’s Fine Stationers, we will donate 15% of the net sale to Danny’s Farm and that’s a very good thing. Five Acres is another local Altadena non-profit that is near and dear to our hearts. They’re running a Thanksgiving food-drive for the population they serve and we want to help! We’ll be collecting the donations here at WFS, but here’s the thing: when you bring your food donations in, please give them directly to a crew member. That crew member will give you a coupon for 10% off any purchase you make at WFS. You can use that coupon that day or save it for later use. It’s just our way of saying thank you for making a food donation to Five Acres. We also have $10.00 coupons that are good for the same amount off a purchase at Macy’s on Saturday, November 14th. Your purchase of these coupons benefits Five Acres and are redeemable on regular, sale or clearance priced merchandise purchases of $25.00 or more. Remember, these are valid on November 14th only. To buy one, just ask one of our crew members. Also on our radar for the weeks coming up is a book signing with Altadena author Andre Coleman. Stay tuned for more information on that event! 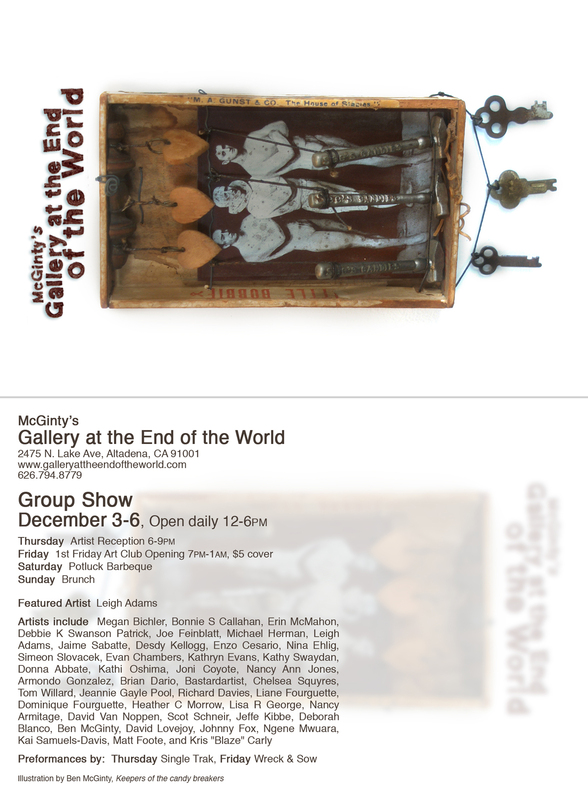 It’s time for the next wild weekend at Ben McGinty’s Gallery at the End of the World. This is shameless self promotion because I’m in the show this time around. I won’t just be hanging around sucking up food and wine, I’ll be answering your brilliant insightful questions about my work. As soon as Ben has the postcards and promo material ready, you’ll see it here. Thurs.-Sun., Dec. 3-6 Noon-6 p.m.
Artists’ reception 6-9 p.m. Thurs., Dec. 3. Here’s the Star News story on Pasadena’s latest “fork in the road”! Channels 2 (CBS), Channel 7 and Channel 5. Tonight. Right now for CBS, Channel 2. It is a great story on a huge gift on my birthday. A great surprise for me. wished me “Happy Birthday” on screen. At 5:00 P.M. I will be featured in an interview along with Ken Marshall, who is the tinker who made the fork. I love forks and Ken made one just for me. Blessings on you Tiny Ken. Kudos to Ken. See the shows for details. I hope it will be amusing. This is a leaning moment on “Publicity.” Repeat: Publicity. Take note. During the 6:00 P.M. news shows Channel 5 and Channel 7 will run their interviews. It may, or may not run during the “late news” on all stations if you are still awake. And where is the spoon and the dish? The mystery deepens.